DUMBO is an acronym for "Down Under the Manhattan Bridge Overpass." It's a section of Brooklyn lying next to the East River, from just north of the Brooklyn Bridge to just north of the Manhattan Bridge, both of which are elevated above it. It was primarily industrial, including some outstanding nineteenth and early twentieth century factory and warehouse buildings. 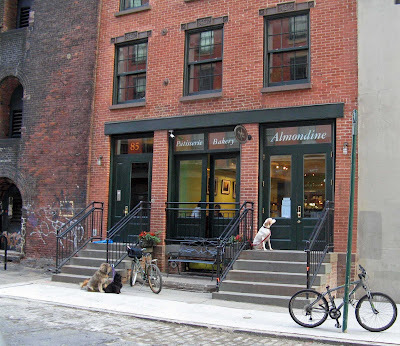 Many of these have been converted to residential use and to artists' studios. This weekend, DUMBO is the site of the eleventh annual Art Under the Bridge Festival, which I've described here. Almondine is reputed to make the best baguettes west of Brest. We love them, along with their delicious almond and chocolate croissants. The bitter and the sweet: Mets are done; USF Bulls prevail. Mets blow it. Stick a fork in 'em, they're done. For the remainder of this season, and post-season, I have my choice of rooting for the Red Sox (my wife's choice, but they had their longed for championship a few years ago), the Phillies (from my native state, and perennial losers, which always draws my sympathy), or the Cubs (who haven't won a championship since the administration of William Howard Taft). So much for baseball. On the college football front, my alma mater, South Florida, continues to amaze everyone, including me. Their upset of fifth ranked West Virginia may get them into the top ten. As a confirmed pessimist in sporting matters, I look for something down the road to derail them. Sort-of archrival Central Florida comes up in a couple of weeks, then there's Rutgers in New Brunswick. Stay tuned. 9/29 baseball update: A bit of pillow talk this morning resolves the issue for me: I will root for the Sox as long as they're in it. Meanwhile, Archaeopteryx, a lifelong Cards fan, declares for the Cubs. ... but this time I want him to be right. 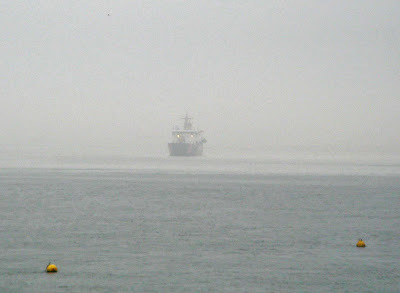 A few mornings ago, heavy fog covered the harbor as this Coast Guard buoy tender lay off the southern tip of Manhattan. The photo was taken from the Brooklyn Heights Promenade. Whither the South Florida Bulls? Joey Johnston says they're the real deal, but John Tamanaha plays it safe and predicts a West Virginia victory Friday night. I've been messin' with the blog. I decided a long time ago that the links on the right-hand column of the blog had gotten to be a problem. Some were links to outdated URLs, and there were others I had been meaning to add for some time but hadn't gotten around to. Also, they weren't categorized in any sensible way. So, I figured out (at last) how to use the new Blogger tools to create categories, which you'll see if you scroll down. I thought up cutesy names for most categories, but by the time I got to artists, architects and sports, the muse of cuteness had deserted me. My one big addition is the music section, which I've expanded enormously (and put near the top, for you folks with short attention spans). I've scoured the web for the best links, mostly live performances on YouTube, of some of my favorite musicians and groups. Think of it as my free, electronic video jukebox. I'll warrant everything here terrific, but I'll mention a few that may be unfamiliar to many of you and that I think deserve attention. The Be Good Tanyas are a three woman group from Vancouver that I fell in love with about a year ago when I got their album Blue Horse. The Littlest Birds is one of the best songs from that album; here it's given a video treatment that includes scenes from pre-Katrina New Orleans. Black 47 is a traditional Irish hip hop band led by my old drinking buddy Larry Kirwan. I have a link to their official website, which gives you streaming audio of "Funky Ceili," their thrash metal "Danny Boy," and "Downtown Baghdad Blues," as well as news about forthcoming appearances, etc. I also have a link to their video of 40 Shades of Blue, featuring Larry in his pudding-bowl haircut. I had the pleasure of hearing, and afterwards meeting, Clarence "Gatemouth" Brown at Blues Harbor in Atlanta about fifteen years ago. Here he is doing Dollar Got the Blues in Hamburg, Germany in 1983. Gate was home in New Orleans and seriously ill when Katrina hit; she undoubtedly hastened his death. Here's a link to some scenes from his jazz funeral. The East Village Opera Company does arrangements of operatic arias to rock instrumentation. People who are very invested in how this music should sound are duly offended; others, knowledgeable in the operatic canon, praise them for faithfulness to the composers' intent. Here's their rendition of La Donna e Mobile from Verdi's Rigoletto. I've long been a fan of the British folk-rock group Fairport Convention, and have included two videos of them on my list. One of these, Time Will Show the Wiser, is a real 1960s period piece (it's from either '67 or '68, depending on whether you believe the caption on YouTube or the graphic on the video itself), and features the band's lineup for their first (eponymous) album, with Ian Macdonald and Judy Dyble on lead vocals (both had left the band before Fairport's second album, What We Did on Our Holiday, was made). The other Fairport video I've linked to is Now Be Thankful, from an outdoor performance in 1970. Unfortunately, I couldn't find any good video of Fairport when the late Sandy Denny was their lead singer and pianist. However, I've included her doing a medley of three songs solo, starting with the awesome The North Star Grassman and the Ravens. Newfoundland's Great Big Sea joined with Ireland's national treasure, the Chieftains, to produce a rousing performance of Lukey. Commentary on YouTube suggests that everyone involved in this video, with the possible exceptions of the schoolgirls and the guy driving the shooting brake, was several sheets to the wind when it was made. Maybe GBS brought a bottle or two of screech with them when they visited Ireland. Mark Knopfler, best known as one of the founding members of Dire Straits, is a stone guitar genius. About a year ago, I saw something about his collaborating with country songbird Emmylou Harris, and thought this sounded intriguing. Here's a video of the two of them doing a song called This Is Us, in a concert in Brussels. I also have Knopfler jamming with another guitar legend, Eric Clapton, on Dire Straits' original hit, Sultans of Swing. I wasn't able to find video of Marshall Chapman (see my earlier post on her here) in performance, but I've linked to her official website, Tallgirl.com. If you click on "To order CDs," you can play generous samples from some of her songs (no obligation to go on and buy, but I think you'll be strongly tempted). Can I ever forgive Delbert McClinton for wearing a Yankee t-shirt (in Austin, no less)? I'll close with an open-ended question: if Self-Absorbed Boomer was an open source blog, what would you change? People keep hitting my blog from web searches for the latest AP college football top 25, so I'd better put the link up now. There you are. My alma mater, South Florida, advances from 23rd to 18th in both the AP and USA Today polls on the strength of a convincing victory over a weak North Carolina team. Meanwhile, the Florida Gators fall back from third to fourth in the AP poll (though retaining third in the actually more important, since it counts for BCS rank, USA Today poll) after having a near-death experience in Oxford, Mississippi. Everything in my bones tells me that South Florida's glory run will come to an end next Friday evening against West Virginia, but then I didn't think there was any way they could beat Auburn. I'm more confident that the death knell for the Gators will sound at Baton Rouge on October 6th. But then, I didn't think there was any way they could beat Ohio State.